An annual, naturalized wildflower (weed) from Europe. This attractive little plant is a prolific seed producer, with 4 seed-bearing nutlets per flower. The 2-lipped, orchid-like flowers occur in dense clusters (glomerules) in the axils of opposite leaves. The flower has 4 stamens and 5 calyx lobes. The stamens are in two pairs of unequal length (didynamous). Another classic identification trait for this family is a square (4-sided) stem. In addition to the showy, 2-lipped corollas, this species also produces small, cleistogamous flowers which are self-pollinated. 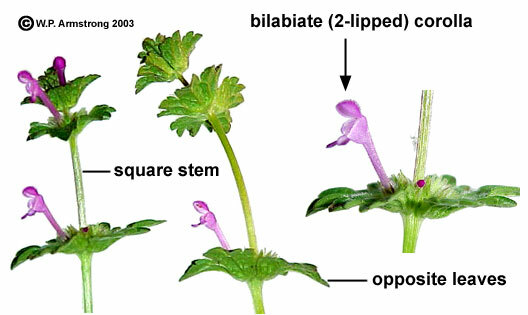 The gynoecium is similar to the Boraginaceae. Each carpel of the 2-carpellate ovary contains two ovules. Pericarp tissue around each ovule results in a deeply 4-lobed ovary which breaks apart at maturity into 4 one-seeded nutlets. 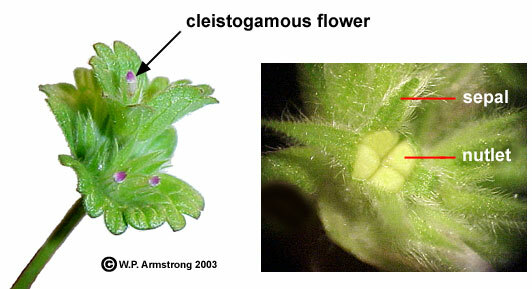 The 4 nutlets in the above photo came from a cleistogamous flower, proof of self-pollination and the flower's fertility. Perhaps having both insect-pollinated and cleistogamous flowers insures an abundant production of viable seeds.